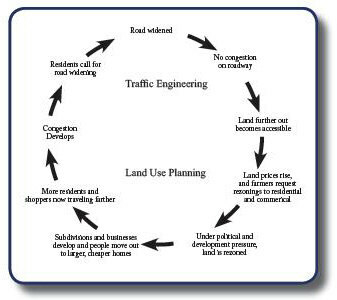 Transportation capacity - land development cycle: For decades, the usual approach to traffic congestion was to add lanes and build roads. However, the New Jersey Department of Transportation (NJDOT) has found that additional lanes don't always solve the congestion problem. Additional lanes sometimes make it attractive to build new homes and businesses, but this development attracts new people and the lanes again become crowded and need to be widened. Separated land use patterns: The idea of separating land use, which began as a way of separating industrial and residential areas, also separates people from the goods and services they need. It now requires the use of a car, and sometimes lengthy trips to meet basic needs. the futility of "building our way out of congestion". 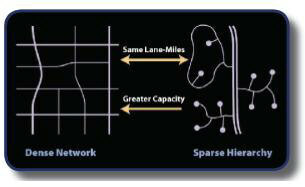 Unconnected street networks: The graphic below depicts the differences between Traditional Development patterns (Dense Network) and Modern Development patterns (Sparse Hierarchy). These two distinct patterns affect travel on the major highways. Mile for mile, a dense and connected street network provides more ways to get to the same location, and has more carrying capacity than a sparse hierarchy, which requires all trips use the same collector roads. The combination of these three trends has resulted in the reality that driving is often the only option in many communities. The trips that were once walkable or bikeable, now add millions of cars to our roads every year. The Texas Transportation Institute's Urban Mobility Report on congestion levels and trends ranked northern New Jersey in 2005 as #2 out of 437 urban areas in travel delay and excess fuel consumed due to congestion conditions.